THIS IS BOOK 3 IN A SERIES! This review is really late! I read this book weeks ago! I loved these characters! Reached, the final book in the Matched series, featured points of view from the three main characters: Cassia, Ky, and XANDER! Oh Xander … what can I say about how wonderful he was?! Ky was a great guy too. His life had been difficult, but he showed his strength with his devoted love to Cassia. Cassia learned new things about herself and her society. I enjoyed watching her progress. My only complaint would be that it felt slow at times, but I understand that not every book can be all action and romance. I have to say that this is the BEST ending to any series I’ve ever read! I’ve never been more happy with the ending of a series. Their lives at the end were definitely not perfect, but I felt that everything worked out like it should. I’m not going to spoil the read for anyone so I’ll just say that during a romantic scene at the end I was totally crying and saying things like, “That is the sweetest thing I’ve ever heard!” as my voice got higher and squeakier. Hahaha you know a romance is beautiful when it makes me cry. This was a great series! You all should read it! The Matched trilogy is a huge success. Ally Condie is only going to get better, and I'm really looking forward to seeing what she writes next now this trilogy is over. 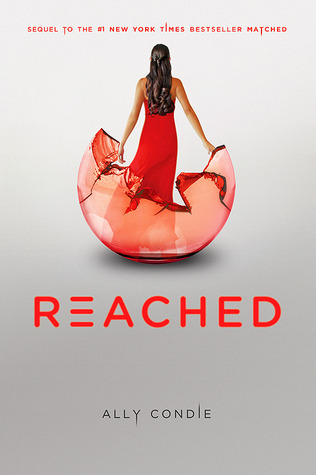 Emilee- I loved Matched too, but I think I might pick Crossed as my favorite of the series. Hmmm that's a tough choice. This book was very different from the rest of the series. I think the Matched is still my favorite, but this one was good. I think the plague was a very interesting add in! But, I think the end was a little too typical! :/! Marty- I totally understand. It took me 2 weeks to finish it which is unusual for me too. The plague details and events slowed it down because I prefer lots of action and/or romance. If you're halfway through it should start to pick up soon. The ending really is great! I hope you have a wonderful Christmas break! It's so fun to hear from you. Sarah- Yay! It was a good feeling at the end. Love that. I KNOW!! I cried. I wrote a blog post full of extrememly dorky emotional gifs! I felt this wonderful, “all is well” feeling when I closed the book. Hannah- Oh yay! I can't wait to see what you think of the finale.